Big Data era places new demand on data storage. Storage must support varying data types, all of which need to be stored securely for a long periods of time and be available for analysis. There is an increasing focus on data unification that the storage infrastructure for big data has to serve structured, semi-structured, and unstructured data types. Growing emphasis on in-place analytics require compute workloads such as Hadoop Map/Reduce operations to run right where the data lives. Compliance market is fraught with challenges stemming from regulatory and compliance requirements. Data storage is not immune to these challenges and how data gets stored in the long term. 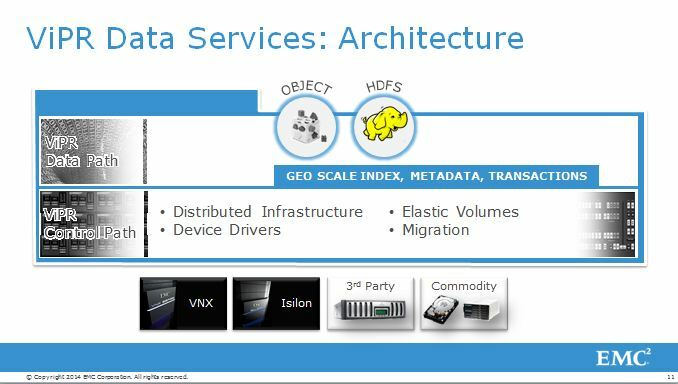 In ViPR, file, block, object, and HDFS are all data services. Object and HDFS are available with more to follow. Data services can be used to provide different semantic views of the same data. This can help to manipulate a file as a file or as an object without having to move the data to a different platform that features that semantic. ViPR’s direct benefit is its ability to automate storage management and provisioning. It makes storage available as a self-service, a consumable resource within the software-defined data center. ViPR also transforms data services delivery in large enterprises. With storage arrays and storage services defined in software and managed by policy, ViPR enables organizations to deploy unique Data Services that will enable existing infrastructure on its journey to the cloud. Thereby ViPR extends the use cases for their data and adds value to their storage investments. This entry was posted in ViPR and tagged EMC, ViPR. Bookmark the permalink.